9/22/2015 10:00am: Last night’s city council hearing on the health and safety impacts of coal ran late into the night. According to Oakland City Clerk LaTonda Simmons, 694 members of the public signed up to speak. A worker cedes his time to Jerry Bridges, president and CEO of TLS. At the end of the night, councilmember Dan Kalb moved a motion to keep the city’s hearing on the health and safety impacts of coal open until October 5. The public is invited to continue submitting comments and evidence until then. Kalb’s motion sets a deadline for a city decision, which could result in permitting or banning coal shipments through the city: December 8. A few things were apparent from last night’s council hearing. Pro-coal speakers are worried mainly about securing jobs. They repeatedly said if the city bans coal it could cost Oakland thousands of jobs. Opponents of coal said, however, that this isn’t a jobs versus environment battle. Leaders from the ILWU Local 10, ILWU Local 6, SEIU 1021 (including the leader of its port chapter) all said that the city doesn’t have to accept coal to successfully create jobs at the Oakland Global project and its bulk commodity terminal. 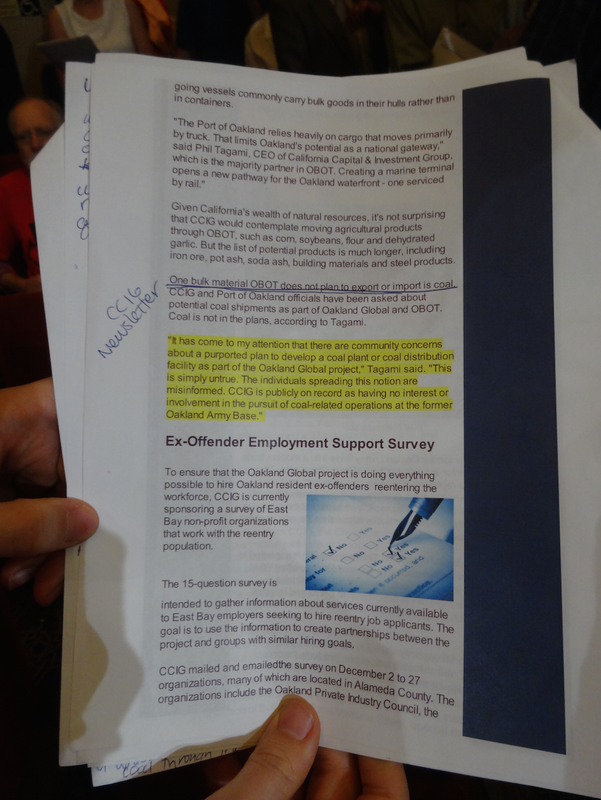 What was also apparent last night was that CCIG and TLS, the companies behind the coal export proposal, bused in dozens of construction workers to the council hearing, and signed them up for the public comment period, but none of these workers were allowed to speak to the council. Instead they were instructed to cede their time to CCIG’s lobbyists, attorneys, and other experts paid by CCIG to speak in favor of coal. It’s not the first time, and it won’t be the last time, big business literally paid for the appearance of popular support. I wrote about this tactic back in March. And I’m not the only reporter who noticed it happening again last night. All night long I attempted to interview at least 20 of the workers brought to the council meeting by but none of them would utter a word. Instead they would look down at the ground. Some would mutter in Spanish that they didn’t speak English. Two of them actually fled me and ducked into a bathroom to avoid my questions. All I wanted to know was why they came to the council meeting, and how they felt about the possibility of shipping coal through Oakland. But one of these workers did talk to me. “Lots of these guys are getting paid their regular hourly wage to be here. They were given free lunches and these T-shirts too,” said Oscar Madrigao, a construction worker brought to the meeting by Alarcon Construction, one of CCIG’s subcontractors. “They’re being used,” said Madrigao about his fellow workers. I tried talking with CCIG’s representatives as well as leaders from the Laborers Local 304 Union about Madrigao’s claims. Fernando Estrada, the business manager of the Laborers Local 304 said he couldn’t comment. Several of CCIG’s lobbyists refused to identify themselves to me, let alone explain the situation with the dozens of workers they had brought to the meeting. At least two people in the council chambers were shepherding workers in and out of the meeting so that they could cede their time to CCIG’s spokespersons. They would bring the workers in through a side door, hustle them to the podium to state their name for the record, and then hustle them out of the chambers. I tried several times to speak with these workers on their way out of the chambers, but several times a woman working with Greg McConnell, CCIG’s lobbyist, literally pushed me to prevent me from speaking with the workers. When I asked her who she was, she refused to tell me. Outside the council chambers I asked other workers if they had been coached to say nothing to the press. I asked them where they got their yellow T-shirts. I asked them if they were being paid to be there. And above all I tried to ask them how they personally felt about coal. None of them would utter a word. 9:15pm: There's still a line of speakers against coal, but I'm packing it up for the night. I'll write a re-cap of the meeting tomorrow. 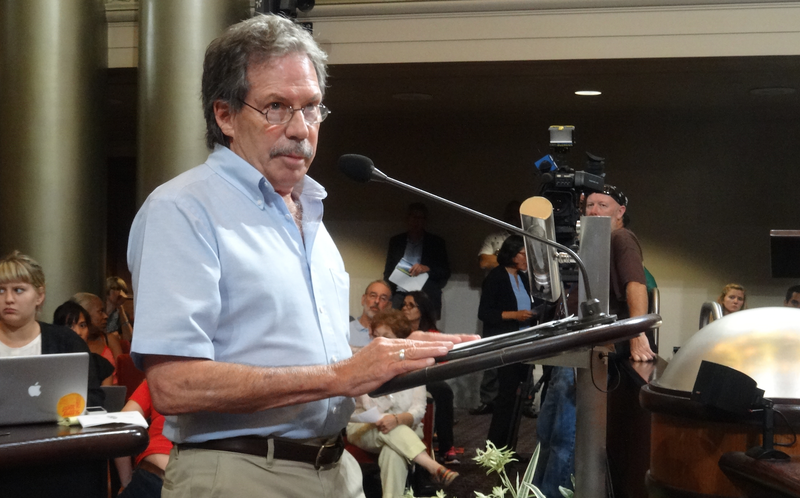 9:00pm: Richard Grasetti is a California Environmental Quality Act expert. He also knows a lot about the federal environmental law, the National Environmental Protection Act. Both laws, CEQA and NEPA for short, require that governments study the impacts of their decisions, including projects like the Oakland Global trade center. Grasetti has helped numerous governments review major projects across California in order to comply with CEQA and NEPA. 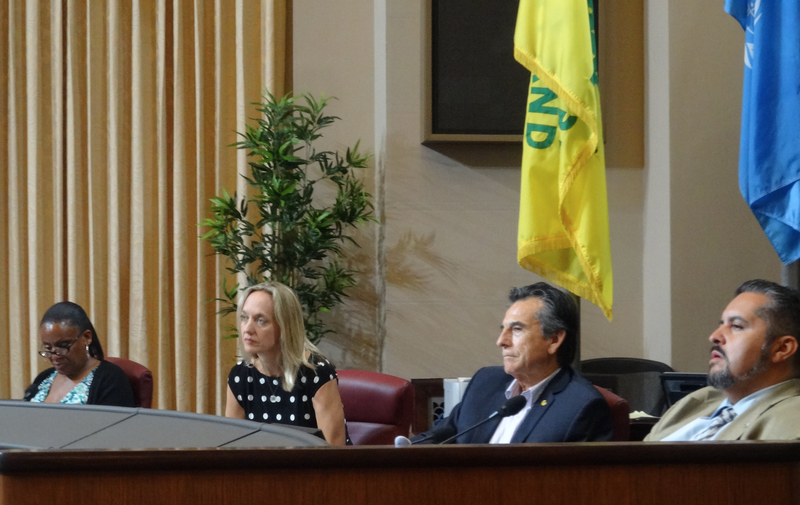 Members of the city council listen to Grasetti talk about CEQA law. According to Grasetti, the proposal to export millions of tons of coal from Oakland were never studied in any environmental impact analyses for the Oakland Global Project. “This is a major change to project,” said Grasetti about the coal export plan that only became publicly known in April of this year. 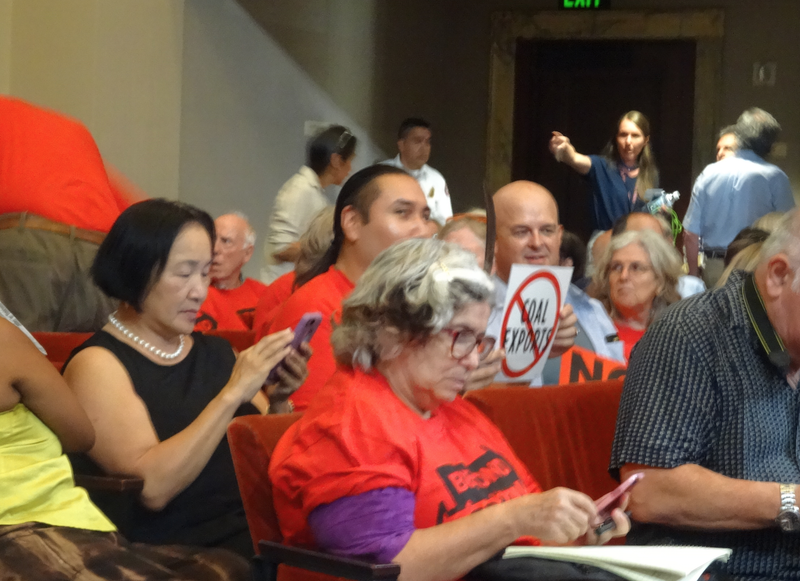 “CEQA requires you reopen the project,” said Grasetti, meaning that Oakland might need to conduct a new environmental impact study that examines coal shipments before any forward movement with the project. “I suggest that you enact emergency moratorium on coal terminals in Oakland, and while that's active, move ahead on CEQA analysis of coal terminals in Oakland.” said Grasetti. 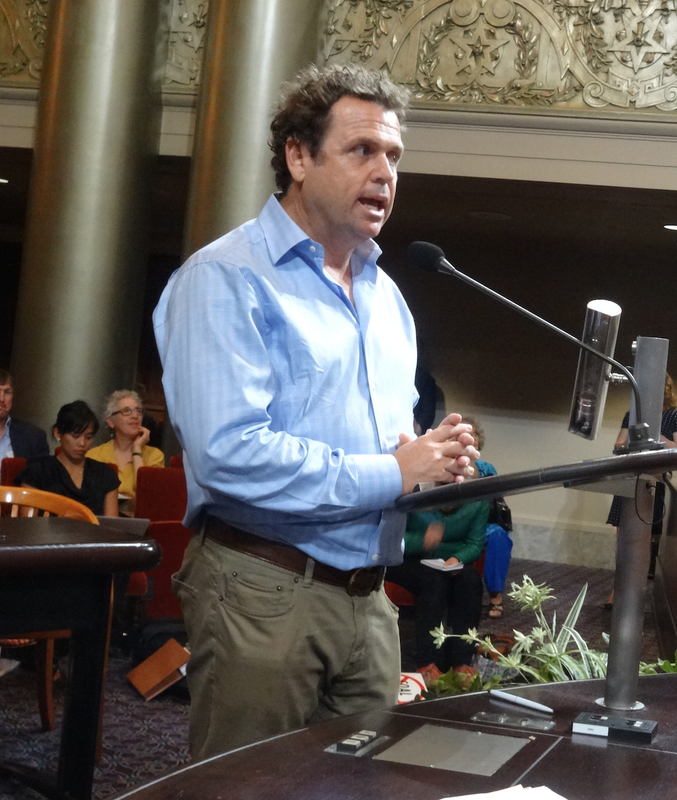 8:20pm: Danny Kennedy, one of the founders of Sungevity, told the Oakland city council that the coal industry is dying. The city shouldn't invest in a dinosaur industry, but instead in the future, he said. Kennedy's comments aren't merely the self-serving comments of a solar industry executive. Several coal companies recently declared bankruptcy. Investors aren't bullish on coal's future prospects. Coal company executives worry in their financial reports that government efforts to address climate change are rapidly phasing out their industry's ability to turn a profit. Kennedy said his industry is growing and adding jobs, but coal is a dead end. “This is asbestos, this is tobacco. 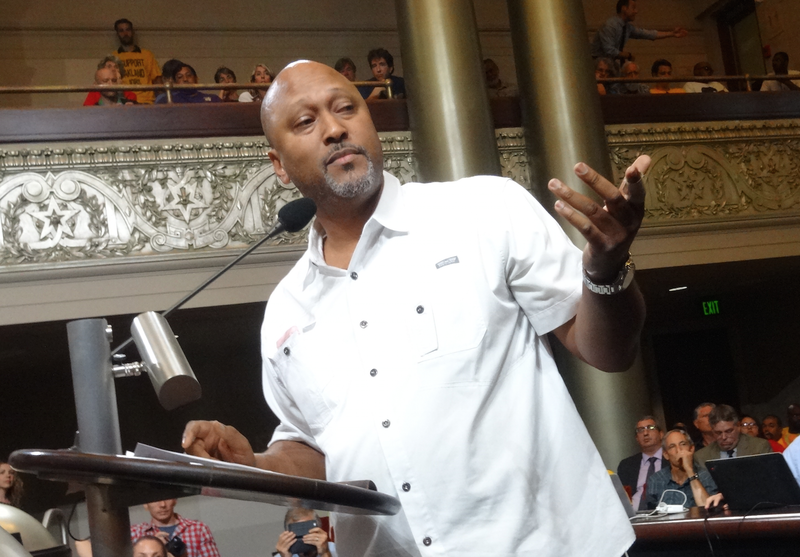 Oakland doesn't need this albatross around it's neck,” Kennedy told the council. Kennedy said also that renewable energy companies, like Sungevity, which is headquartered in Jack London Square, will likely avoid Oakland if the city ties its future to coal. 8:02pm: Several years ago in his newsletter chronicling the transformation of the the old Oakland Army Base into the Oakland Global logistics and trade center, Phil Tagami pledged that his company, CCIG, would not be building a coal facility. Marie Walcek of the California Nurses Association brought the newsletter to tonight's hearing to remind the councilmembers of Tagami's promise. 7:31pm: Jean Quan made an appeal to her former colleagues tonight. Perhaps it's a sign that Quan is planning a political comeback at some point? In the very least the hearing is making clear that coal will be a political issue for some time to come in Oakland. 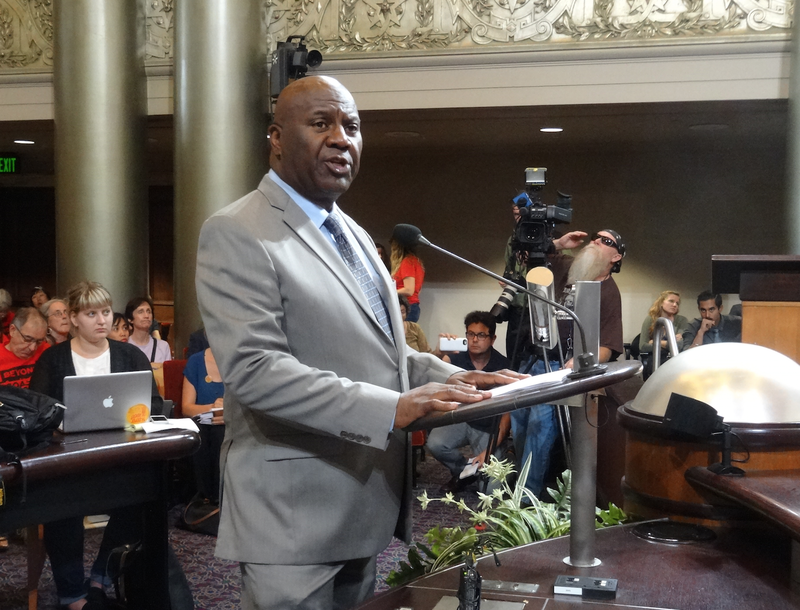 Quan, who led the city when the Oakland Army Base redevelopment project was negotiated, said that coal was never part of the plan. She's shocked it's now a central part of Tagami's plans. 7:10pm: Kathryn Floyd, a lawyer that CCIG paid to appear before the council tonight, argued that federal laws pertaining to railroads preempt local laws. Kathyrn Floyd, a lawyer representing CCIG. The implication is that Oakland can't ban coal shipments through the city because it would interfere with federal railroad laws. “Theoretically if this city were to take a position that coal could not be transported in interstate commerce, that would be a problem and would be preempted,” Floyd told the council. Multiple members of the council interpreted her point as meaning, however, that because federal laws preempt any regulations pertaining to the shipment of coal, the city cannot hold TLS to any promises it makes about covering railroad cars that would ship coal through the city. Project proponents pointed out in a letter to the city council today that while shipment of coal via rail might be regulated purely by federal law and beyond Oakland's reach, the city certainly can regulate what gets built on the Oakland Global project site, which is owned by the city. Derrick Muhammad, business agent for ILWU Local 10. 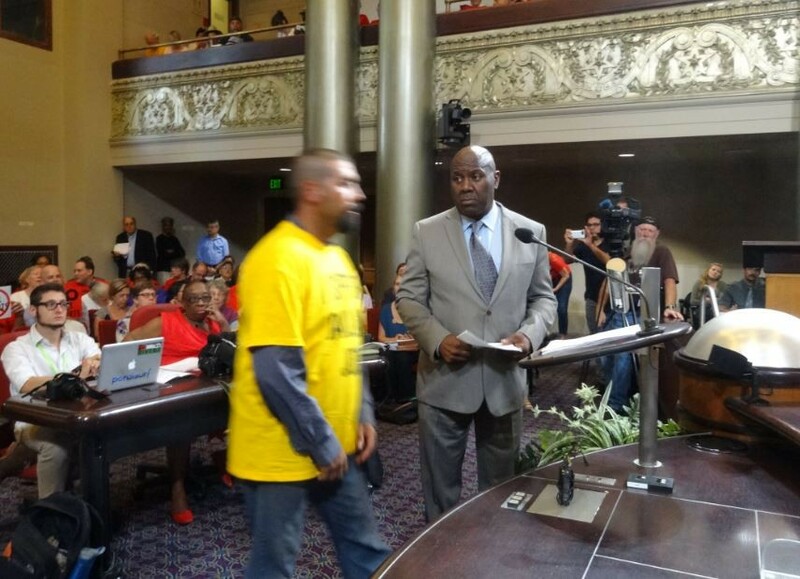 That's ILWU Local 10's message to the Oakland city council regarding coal. Muhammad noted that the railroads and port facilities that would ship coal are adjacent to majority black neighborhoods that already suffer from the highest rates of asthma in northern California. “So no to coal,” Muhammad concluded. 6:22pm: The US EPA just weighed in on plans to export coal from the Oakland waterfront. Richard Grow of the US Environmental Protection Agency. Speaking in official capacity for the nation's top environmental regulatory agency, Richard Grow, a project officer for Region 9 of the Environmental Protection Agency, warned the city council that the kinds of environmental issues raised by coal transportation and storage have never been studied for the Army Base redevelopment project. He cast uncertainty on the rights of the Oakland Global developers and the city to permit the shipping of millions of tons of coal through the city. What this means for the project isn't clear. But Grow also said he finds the secretive nature of CCIG and TLS's dealings with Utah coal companies disturbing. 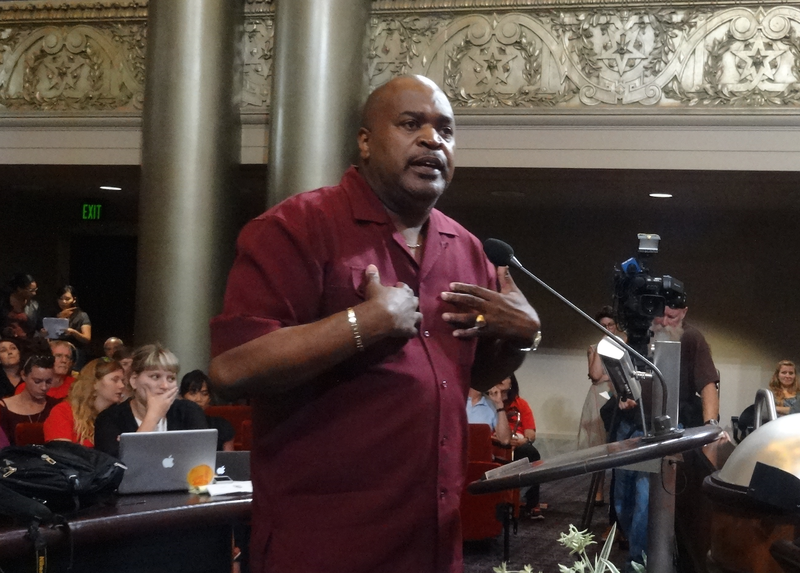 Pastor Kevin Hope supports shipping coal through Oakland. 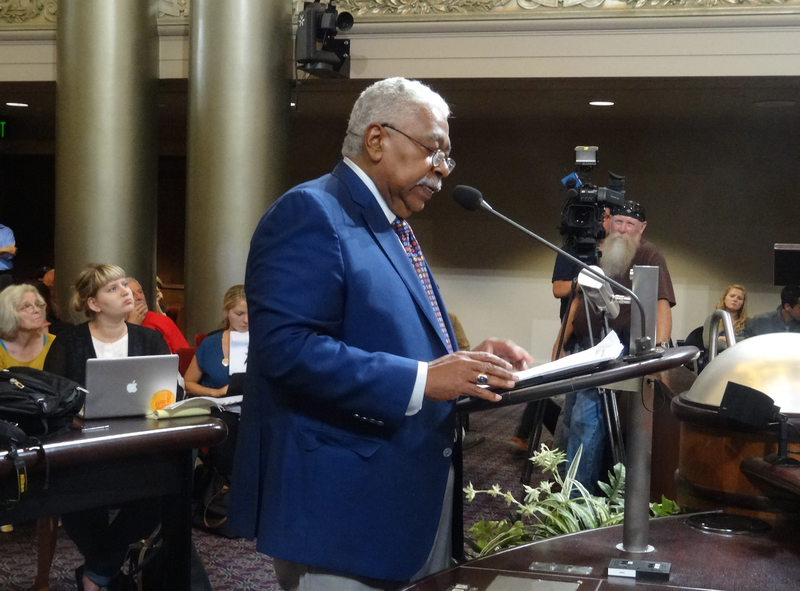 5:15pm: Jerry Bridges, the president and CEO of TLS just spoke to the Oakland city council defending his plan to export coal from the city's waterfront. But bridges emphasized that coal would be one among many commodities the terminal handles. Jerry Bridges of Terminal Logistics Solutions. 4:51pm: Debbie Niemeir, a professor of civil and environmental engineering at UC Davis said she reviewed the materials that CCIG and TLS have made available to the public. Greg McConnell speaking in support of coal. 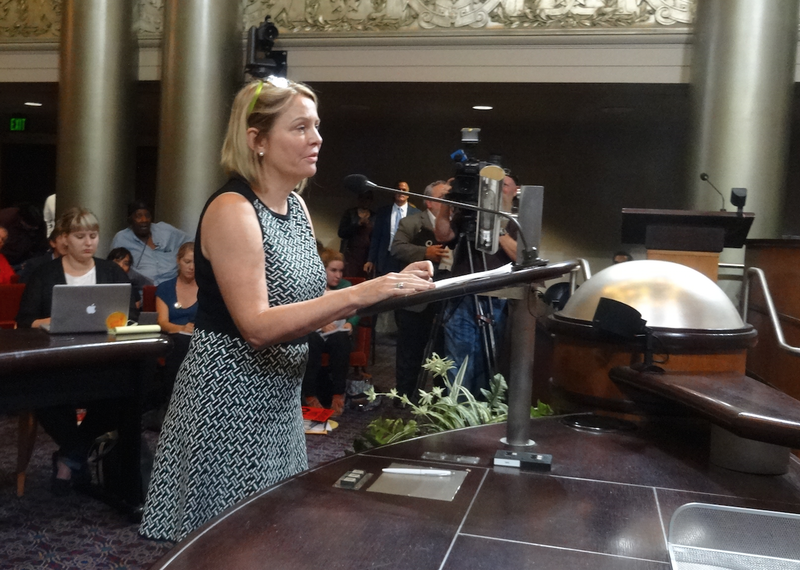 She said the proposed project will definitely have a direct and proximate impact on Oakland's environment and the health and safety of workers. “The proposed 10.5 million tons of coal shipped annually through Oakland will generate 30 million tons of CO2,” added Niemeir. “That's the size of seven average power plants. Next up was Greg McConnell, a lobbyist who said he had been retained by the California Capital Group to give an overview of the plan to export coal. McConnell said the bulk commodity terminal will create 11,970 jobs. He did not say how the exclusion of coal would impact that number. "Everything it's going to do will be in full compliance with air quality mandates," McConnell added about environmental concerns. 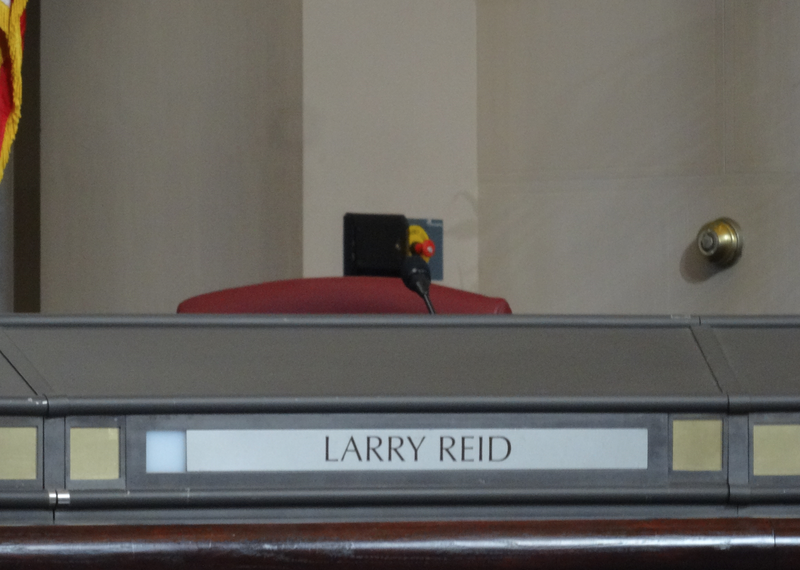 Larry Reid was one of the city councilmembers who called the special meeting on coal transportation through Oakland, but he's absent tonight. According to the Oakland City Clerk approximately 583 people have signed up to speak on the issue. The chambers are packed, as are overflow rooms in City Hall. Assistant City Administrator Claudia Cappio is about to give a presentation on the issue. The Oakland City Council is hearing testimony today regarding the potential health and safety impacts related to the transportation of coal through the city. 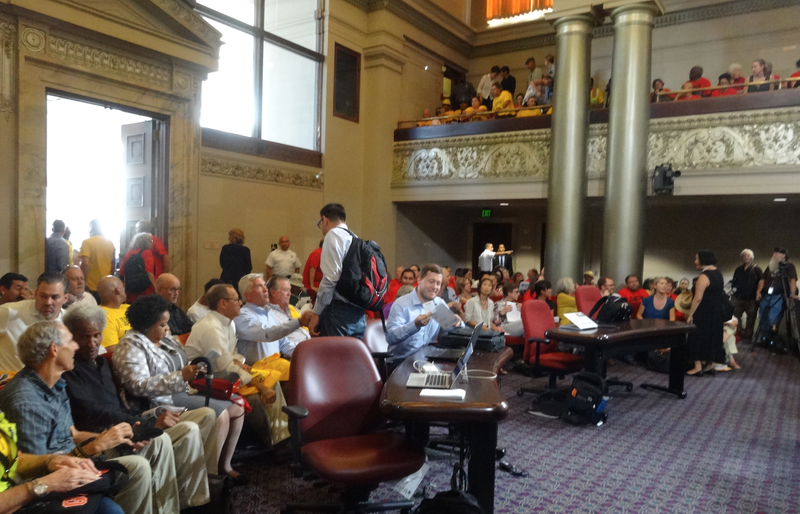 Oakland city council chambers are packed for today's hearing on coal. The hearing was called after it was revealed months ago that developers hope to export millions of tons of coal from a terminal that will be built at the Oakland Global project at the old Army Base. I'm live blogging the hearing today. Check back on this page for updates throughout the afternoon. Hundreds have turned out for the hearing. The Laborers Union Local 304 turned out dozens of workers waring bright yellow T-shirts with "I support Oakland jobs" written on them. The Laborers hope to secure jobs by building the coal export terminal. Most other unions, including the California Nurses Association and SEIU 1021, oppose the coal export plan. Dozens of community groups and environmental organizations like the Sierra Club and West Oakland Environmental Indicators Project have rallied opponents also. Former Oakland Mayor Jean Quan among opponents of the coal export plan. "This project has already produced many jobs," said Fernando Estrada, the business manager of the Laborers Local 304. "We understand the environmental issues, but the key is to reach compromise on all sides." 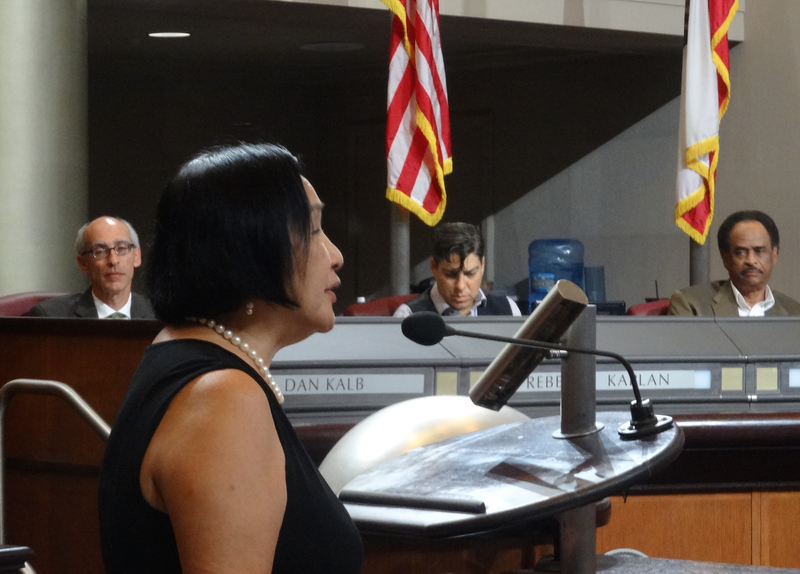 Former Oakland Mayor Jean Quan is among the many opponents of the project in the chambers today. Yesterday Quan sent an email newsletter to her supporters calling the coal proposal a threat to public health. Quan added that she believes coal threatens the viability of the massive Army Base redevelopment project: "I think the inevitable environment lawsuits would delay our development and the project would tie up our shipping capacity to a "dirty" out-of-state product that puts our future at risk," she wrote.